So, you got your Arduino board, installed Arduino IDE, started a new project and went: “Hold on a second?! This is not real microcontroller programming!”. Arduino C++ wrapper is great when you are taking first steps in hardware programming world, however it hides a lot of aspects of what is happening under the hood. If you are bit more advanced with programming you want to write your code in plain C and get dirty with all features of your AVR processor. Atmel Studio seems like an obvious choice for replacing Arduino IDE. This guide shows you how to configure Atmel Studio 7 to support your Arduino board on an example of Arduino Mega 2560. This tutorial assumes you are running Windows 7, you have Arduino IDE already installed on your system and that you want to program your Arduino via on-board USB port. First of all, you need to download Atmel Studio from Atmel’s website. The download is free, however you need to complete registration form. Once downloaded, follow the installation wizard steps. Plug your Arduino board to your PC via USB cable. Click Start, right click Computer and select Manage. From left-hand pane select Device Manager, expand Ports (COM & LPT) and find your board. Write COM port number down (in this example COM3), it will be needed soon. In Command text box enter full path to AVRdude executable. This should be located in hardware\tools\avr\bin subdirectory of Arduino IDE installation directory. If you haven’t changed Arduino IDE’s default installation, the file should be located as per the below. I recommend deselecting all remaining options, however this is down to personal preference. Click OK to accept changes and close the dialogue window. From left hand pane highlight C/C++, select GCC C Executable Project and name your project accordingly. Copy and paste the below code to make the on-board LED (digital pin 13) blink. The below is applicable for Arduino Mega 2560, you may need to tweak the code depending on the pin out and setup. Check Output window at the bottom and ensure the project has compiled successfully. 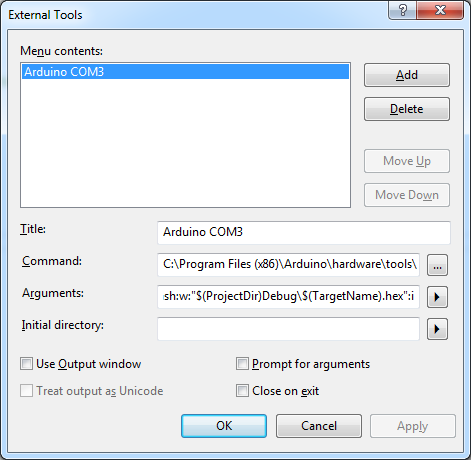 Program your board by selecting Tools > Arduino COM3 (substitute Arduino COM3 with name you gave it in stage 3). 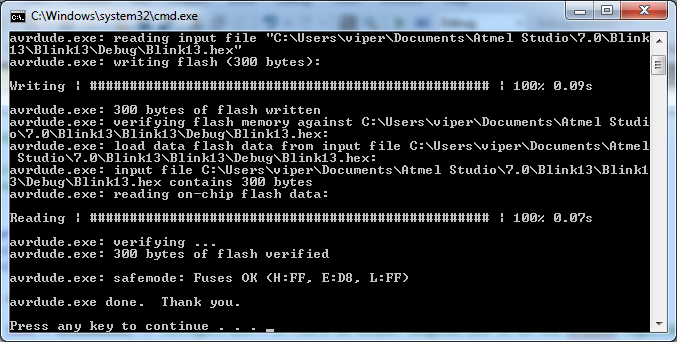 Check the output of the command, ensure it flashed the memory successfully and enjoy a blinking LED! If command has not finished running successfully, review the output and change you command parameters as required. That concludes this mini tutorial. You should now be ready and set up to dive into C development for your Arduino board! I am trying to set up Atmel Studio according to your tutorial, but no where can i find the external tools tab as per your tutorial. 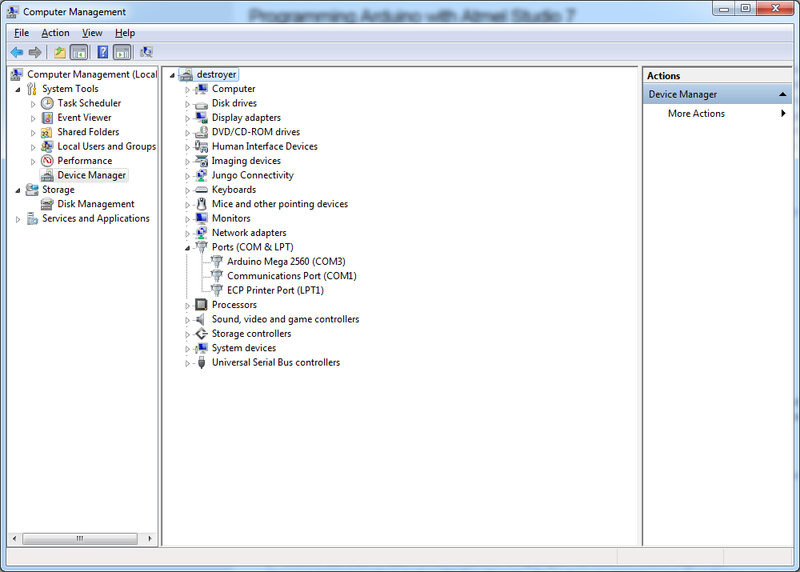 I am using Atmel Studio 7 (version 7.0.790). Please can you help? Found the problem, i was using the standard interface and not the advanced interface, all sorted. thanks for the tutorial. will the bootloader be overwritten? My COM port is correct and my Arduino is a Mega 2560 too. Thanks and sorry for the long post and my bad english. 2- Changing -b from -b115200 to -b57600 has solved my problem. I know that we may adjust to use -b115200 from device manager, but I’d prefer to use the default to just make it work. I was not sure if my board support that seed or not. 3- Adding -carduino, Arduino IDE added this also to the command line arguments. I realize this is an old comment, but I received the exact timeout error and I was able to upload by by changing -cwiring to -carduino. I turned on “Show verbose output during upload” in Arduino IDE > Preferences to show the full command that the Arduino IDE executes to upload. That’s also how I discovered -patmega328p for my Arduino Uno. Hope this helps future readers of this useful post. Thank you so much for this really helpful guide! Hi, very excellent mini tutorial DIY (Do It Yourself)!! But If you may help me with some config poitnts, I will be very glad. I think it could be some troubles that another C/C++ beginners could have too. When I done all the steps you said, I see that you don’t say nothing about Arduino Mega version. It makes difference? I can’t finish these steps with success, already. I ‘m using Lseeduino, with a PL2303TA USB chip Interface, that is not a microcontroller. I’ve verify previously the Interface Manager (W7), and installed the Prolific USB_to_Serial COMM(16) driver, and its all OK.
Congratulations for your mini tutorial, its excellent and very helpfull!! Thank you very much for helping me. i was struggling so many times to program mega using atmel studio 7. HI As per se your Instruction. The bootloader must be changed for Atmel Studio, isnt it? Could you tell me what this means and how can i fix it? Thank you. Thanks for the tutorial. There are several really good questions asked above. Would you be as kind to answer them? Especially the ones on Bootloaders and error message. Again, thanks! Thanks! It is a great Work, also for sharing it! !